I had a bad night so am rather grouchy today. I cooked my suncatchers (painted glass) which have taken days making, including false starts which resulted in the application of vast quantities of white spirit and the precarious and unpleasant task of scrapping the paint from the glass with a very sharp knife. I happily put them in the oven, forgot about them until I spelt burning and now the paint is hideously bubbled. Bugger, bugger, bugger. Then there's the Ouch Messageboard - I have removed my link to Ouch to help me with the latest attempt at Cold Turkey. I tried to cheer myself up by listening to the Radio. I listened to The Friday Play on Radio Four (like you do on a Saturday) and it was so bad. Radio Drama is so rubbish at the moment, so badly written. Makes the Archers sound like Chekov. This particular banality had a wheelchair-user in it, which added to my irritation, and I turned it off half-way. I have also thinking about disabled people and pantomimes. They’ve been putting on the nativity at my Mum’s school this week. She is baffled by the fact that the entire first year (twenty-one children) have been cast as Cockerels. You know, those famous cockerels that turned up at the birth of Christ? One of the older children is privileged with the role of the only speaking cockerel. Hmm. But Mum said that there was a kid who had broken his leg such that he had to use a wheelchair and have it sticking out in front of him all the time (the leg I mean). He had been cast as a sheep. Anyway, I was thinking about this and then other seasonal plays and then onto Cinderella. I suppose it is a bit obvious, a disabled Cinderella. She can’t get out much, her family are ashamed of her and she’s kept hidden away from view. The turnip turns into a funky electric wheelchair, the pumpkin into a Sunshine Bus. No? Her wicked step-sisters said that she couldn’t come to the ball because she wouldn’t be allowed in, but turns out the Palace is fully accessible – as is Prince Charming. And the glass-slipper could be… something a chiropractor would approve of, anyway. The fairy godmother was always the best character in Cinderella, but I’m not sure what you’d do with her. Depends if you wanted to entertain adults or children – and then what type of audience in either case. The fairy godmother in Cindrillon was one of my greatest roles in high school drama – certainly the greatest role I performed in French (okay, it was the only one). I wore my mother’s wedding dress with gold Doc Marten boots. In other news, yesterday I received the funkiest hot-water bottle you ever did see from my friend. It has goldfish in it. How cool is that? My friend is a woman of profoundly good taste and great generosity. 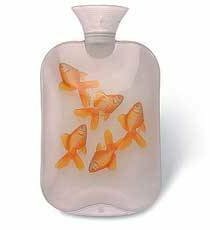 I don't think you can say that a hot-water bottle is cool, but if you could, that hot-water bottle is. I wonder if they do one with cats on? Your idea about a crip Panto has got me thinking (it's okay there is no damage). Maybe the Fairy God Mother can work for Access to Work or Social Services. She has the power to provide a funky chair and ramps and other living aids and this enables Cinders to attend the ball, where she meets her Prince Charming who falls for Cinders becuase of her charm, beauty and knowledge of the DDA. Well this is it; you could do a 'send-up' for a largely adult disabled audience and we could really have a laugh about that. Or you could do it for children, and merely entertain them, subtly prizing open their little minds with the concept of a crip as a role model and a wheelchair as a liberating piece of kit. It's not terrible Pete, but do you think folks are ready for that? Hmm... having asked that question I think they probably ought to be. You have me thinking. I will go away and think some more. Did you ever see a TV drama with Ken Stott called Taking Over the Asylum? It had our new Doctor Who in it too I think. No I missed that one Goldfish. I like Ken Stott though, good actor. Fall on your knees, Oh hear the angels' voices!